Whether served for a hearty supper or festive holiday gathering, these comforting, easy-to-make recipes are sure to delight friends and family. If you’re not a fan of white chocolate, feel free to use all semi-sweet chocolate morsels instead. Substitute your favorite nut—slivered almonds, chopped pecans—in place of the walnuts. Preheat oven to 350°. Bake walnuts in a single layer in a shallow pan 5 to 7 minutes or until lightly toasted and fragrant, stirring halfway through. Meantime, line a 15- x 10-inch jellyroll pan with nonstick aluminum foil. Arrange crackers in prepared pan, breaking as necessary to fit and completely cover bottom of pan. Bring butter and brown sugar to a boil in a small saucepan over medium-high heat, stirring occasionally. Boil, stirring constantly, 3 minutes. Remove from heat, and stir in vanilla extract. Pour mixture over crackers in pan; spread over crackers. Bake at 350° for 13 minutes. (Mixture will start to bubble at about 10 minutes. Continue to bake to 13 minutes.) Remove pan from oven and add peanut butter in dollops; return pan to oven for 1 to 2 minutes or until peanut butter begins to melt. Remove pan from oven to a wire rack. (Mixture will still be bubbly.) Spread peanut butter over brittle. Sprinkle top with chocolate and white chocolate morsels; let stand 1 minute or until morsels soften. 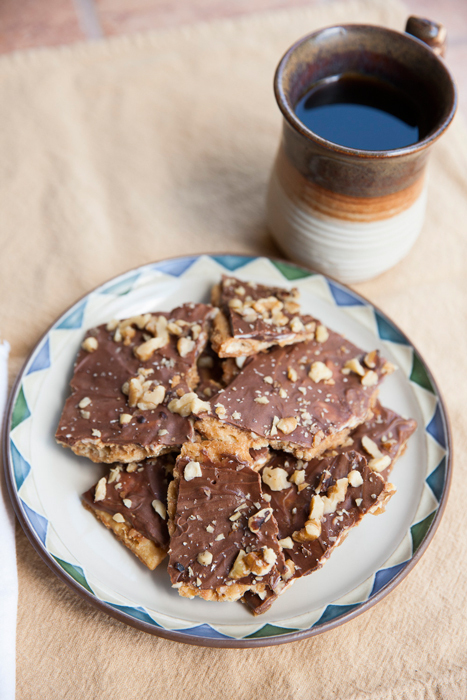 Spread morsels over brittle. Sprinkle with walnuts; let stand at room temperature 30 minutes. Place pan in refrigerator; chill 30 minutes or until chocolate is firm. Break into about 20 pieces. Store in an airtight container up to 1 week in refrigerator. Pat venison cubes with paper towels to absorb excess moisture; place in a large bowl. Combine 1/4 cup flour, salt and pepper in a large bowl; sprinkle over venison, and toss well with hands to coat. 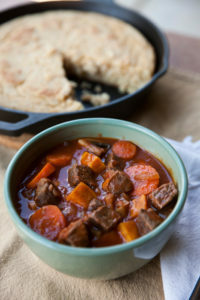 Cook venison in batches in hot oil in a Dutch oven over medium-high heat, 4 to 6 minutes or until browned on all sides. Remove venison. Add onion and garlic, and cook 5 minutes or until onion is soft. Add remaining 2 Tablespoons flour, and cook, stirring constantly, 1 minute. Add red wine, stirring to loosen particles from bottom of Dutch oven; cook until liquid is reduced by half. Add tomatoes and cook, stirring occasionally, 5 minutes. Add venison, broth and Italian seasoning. Bring to a boil. Cover, reduce heat to low and cook, stirring occasionally, 1 hour. Add carrots, sweet potatoes and mushrooms. Cover and cook, stirring occasionally, 1 1/2 to 2 hours or until venison is tender. * 3 pounds boneless beef roast may be substituted. ** Beef broth may be substituted. Coat bottom and sides of a 10-inch cast-iron skillet with bacon drippings; heat in a 450°F oven for 10 minutes. Stir in baking powder, baking soda and salt. Pour batter into hot skillet. Bake at 450°F for 15 minutes. Serve with butter, if desired.